On Wood Street, Swindon, this restaurant seems to have been adapted from knocked-though cellars under shops and houses - lots of stairs to climb on the way in, or to take a pressure break. It's a curry house with an interesting menu, with lots of choice, and the cooking seemed really good. Three of us had dinner there on Wednesday night, and we all enjoyed it. My colleagues chose prawn puree and sheekh kebab, and I took the mixed starter. The prawn puree had a tomato-based sauce rather than a deeper and darker pepper one, but it went down well. Sometimes a mixed started for one can be dull, but this had a good choice of tasters, and gave me a good feeling about the main course to come. 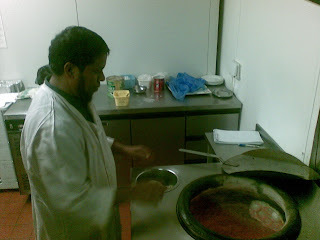 My colleagues both chose chicken tikka jalfrezi - plenty of spice, though they avoided the fresh chillies. I had a chicken korai - good pieces of chicken, hot sauce without excessive fat, and thoroughly enjoyed it. It's a very pleasant and well-patronised place, and you can't always be sure of a free table. They take bookings on 01793 490265, and I'll certainly be going back as part of my Curry Furlong researches. The table is booked! Our last meeting of 2009 takes place at the Spice Lounge restaurant in Petersfield, on Wednesday 9th December. Dinner will be at 20:30 as usual, and aperitifs will be at Foggys. Members, please respond to the e-mail that you'll receive shortly, so that we can get numbers about right. We were last there in July, and at Spice Lounge we always look forward to a warm welcome, warmer curries, and a great social evening - a good way to round off 2009! Looking for a decent meal in windswept Swindon, I turned to Google which found me the Lalbagh restaurant. Somewhere, I saw the claim that it's the best Indian restaurant in Swindon, a town which isn't short of these establishments. The web site said 'National Curry Chef - Swindon Finalists', and Cobra has declared that this week (22 - 28 November) is National Curry Week, so what more excuse did I need? The restaurant can be found in Rodbourne Road, Swindon, which is something of a takeaway strip - fish and chips, kebabs, Chinese, two other Indian places, but Lalbagh is a proper restaurant, if not big. Tonight I needed to avoid heavy fried food, so I started with dal soup - lovely lentil taste, warming and a just the right thing on a cold evening. Then I chose Lamb Darjeeling Special - cooked with hot chillies in lemon flavour sauce - with pilau rice. This was really good - lots of meat, fresh tomatoes and onions, with a subtle tang of lemon. The chilli crept up on me slowly - by the end, I needed to mop my brow. But amazing - the plate showed no trace of grease or fat, and even though I'd left some of the sauce in the serving dish, none there either. Very good food, very flavourful, and this is a restaurant that I'd visit again. Soon. We had a good turnout and enjoyed fine cooking at the Gurkha Chautari in Liphook on Wednesday 11th November. The restaurant seems to be evolving in its style, quite distinct from the Gurkha Durbar in Grayshott, its sister. These are definitely not clones of each other. 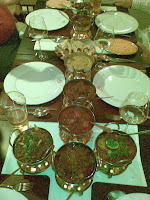 The starters were the usual favourites - chicken livers, choila (peppery lamb), potota cakes and momo (steamed dumplings). They were all delicious - even one of our group who didn't normally eat liver agreed that this was the case. Main courses were Khasi Bhutuwa (lamb), hot prawn curry, a medium chicken curry, sizzling tandoori chicken and a mixed vegetable curry that was so good and full of distinct flavours that it wouldn't disappoint as a main course dish (and I'm no vegetarian). Side dishes included rice, naans and bombay-style potatoes. The cooking was interesting because we couldn't detect any garlic or heavy coriander tastes - instead, there was delicious cooking without heavy sauces. Others commented that maybe there had been too much rice, and maybe we should have had one more meat dish. But the overall impression was of enough spice - some real highlights from sensible use of chili - and everything very good and tasty. This was a very good evening and we thoroughly enjoyed ourselves. Highly recommended. The table is booked! 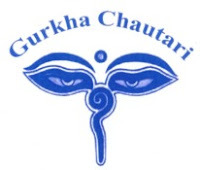 Our November meeting takes place on Wednesday 11th, and the venue is the Grukha Chautari restaurant in Liphook. Aperitifs will be from 19:30 at the Links Hotel, Portsmouth Road, Liphook and dinner will be at 20:30. More details of the restaurant can be found here. We last visited in June 2009 - the report is on our blog. Leaving a week between eating at/reviewing a restaurant can develop perspective, and allow for a little revisionism. However, my impression of Rasa N16, billed as London's finest vegetarian sub-continental, has not altered greatly since Thor's day before last. Val and I left very content*, full of wholesome South Indian homestyle cooking. The pre-meal snacks, chutneys (rich garlic, sour mango, astringent mixed vegetable, light, fresh coriander), and assorted poppadoms, banana chips, crunchy murukku, did more than stimulate the appetite. Starters of meltingly sweet plantains in a light batter, as well as Idli - steamed lentil buns with a stewy veg curry - kept up the eager anticipation. The main events: Rasa Kayi, a spicy bean carrot, cauliflower and potato dish with a lovely undertone of fennel, tangy, mustard flavoured Okra and a rich, nutty ochre yellow daal, accompanied by sweet rice pancakes (Acchapam), as well as coconut and tart tamarind rice completed an eclectic and well balanced meal. It gets busy, mostly with young Americans, and service, while polite and smiley is fast (veg takes little effort to cook - right? ), but later in the evening or earlier in the week, it could be the ideal venue. Super VFM too. The table is booked! Aperitifs at Foggys from about 19:30 and then dinner at the Paradise from about 20:30. El Presidente will be your host next Wednesday evening, as we continue our focus on the restaurants of Petersfield. In September we hope to try out a new Petersfield venue, rumoured to be called Madhubon. Couldn't find it using Google, but maybe someone has a phone number and has already given it a try? Please let us know by e-mail to el.presidente@petersfieldcurry.org.uk whether or not you expect to be there. Looking forward to a great evening! Too hot and humid for a preamble today, so I'll get straight into the review, sweat running from brow, feet in a bowl of ice, and so on. Sri Lankan and South Indian restaurants used to be thin on the ground in London but not anymore, indeed there are several, most a cut above average. Elephant Walk is run by a husband and wife team and three or four very sweet and lovely waitresses. It is small but light in a cafe like way, easy to find - and yes, it is better than average, good to very good. Starter options appeared a little unremarkable with the exception of Idli's and Dosa's, so we went straight into the mains. Eight of us, three Thali's - meat and vegetable curries, rice, Gothamba rotis (similar to Paratha's but more chewy) and sambol - much enjoyed, just as authentic King fish curry with coconut and tamarind and vegetable sambar were. There was a lot of food, too much to sample, even if portions were sensible. I thought Ooru Mus, a Pork curry in a thick treacle coloured gravy was strongly reminiscent of a stringent and savoury roast chilli dominated Madras, while mushy Pumpkin registered mellow coconut but lacked a mustardy bite. Still both were comfortably above par. To summarise: it's decent value, one could get stuffed and get out for £10 if a herbivore, £12 if a carnivore. Beers include Lion lager, apparently ubiquitous across Sri Lanka. The Wine List is mercifully concise, and despite a rather anaemic complexion, the Rose was very palatable. Phew! If you can find Planet India, you are in for a treat. A real treat. The kind you'll want to have all over again. But first a proviso: do not rely on Google Maps, listen to the directions given by the staff, and it helps if you're a fan of Baz Lurhmann - outside, inside it's very 'strictly ballroom'. Once one has gotten over the cheap day glo splendour, the dancing waiters* and the fact the restaurant is v-e-g-e-t-a-r-i-a-n / v-e-g-a-n (no BYO meat allowed) one can really begin to enjoy oneself. Paul Mercurio would eat his purple heart out here! I've never been served by a man in a nightie and flip flops before but he was so warm and kind, bluestockings such as I were able to overlook this. There are all sorts of unusual beers to be had - including Trashy Blonde - but the food is simply excellent. Big, simple, direct, delicious flavours. Large portions too. We consumed with relish (ho ho), homemade Mango chutney and a wonderfully spicy, acrid pickle, then shared (almost) two bowls of chaat - the best, topped with sensationally fresh coriander leaf, sweet and tangy with tamarind yoghurt, and creamy with filling, fibrous chick peas. Taking the option of two half portions for the main course - constituting more than a whole - I delighted in a preperation of buttery little potatoes in a coconut rich tomato sauce and ochre yellow-orange daal, thick and hearty, reminiscent of the most wonderful veg stock. Chris had Sag Paneer, not quite so fulfilling, and Claire a gorgeous, perky Aubergine yoghurt curry. Cumin rice, moist and toasty, proved bountiful. As I gazed out the window at the sea the following morning and spied a lone pink sail, I thought, only in Brighton! I imagine Planet India will remain hip in a kinda lo-kool way for some time, possibly until the inevitable death of our sun. Parveen has been around since 1977 - you could call it a 'stalwart'. In appearance the place is no regular curry house though, more resemebling a deep continental restaurant, the kind you find crammed full of sweaty french sophists on a hot summer evening a travers de la mer. The only sweats you'll get here are from the curries, if you order a Vindaloo in particular. Al, opted for Ginger Chicken, and when it arrived, after regulation pappads, dips, ok Chicken Tikka (with thick red crust of paprika and chilli powder), our waiter announced it to be a Vindaloo...Vindaloo! Yes, the very hottest, dirtiest dish in the world! An awkward minute followed as, stammering in true Brit fashion, we tried to ascertain whether the kitchen had made a terrible mistake. They hadn't. T'was all a humourous jape! Ah! The laughs they must have back there...and the waiter was in on it too! Anyhow, Al quite enjoyed his Ginger Chicken, although the meat was 'a little dry'. For my part, I felt the Lamb Saag was actually pretty lovely, possessing a savoury aroma yet tasting sweet with plenty of cinnamon, while a stewed Aubergine dish carried an odd but not unpleasant ketchup-like aftertaste. The small portions of rather dry pilau were a bit inadequate mind. We had an excellent June meeting at the Gurkha Chautari. The restaurant was quite busy for a Wednesday night, and though our numbers were lower than usual, we were warmly welcomed. Starters were delicious - lamb, chicken livers and momo dumplings. The restaurant chose the main courses for us: lamb and spinach, a hot and a medium version of khursani kukhura (chicken), hot prawn curry, monkfish, and 'Katmandu kukhura' - a mild chicken dish. All of these tasted really good, and were complemented by some vegetable curries, rice, chilli potatoes (sauteed rather than cooked in a sauce like Bombay potatoes) and dhal. "some of the best flavours we've tasted"
"one of the best curries I've had"
"I usually find this place a little mild, but tonight - perfect"
"next time I eat here - monkfish"
"best food, best service, best music"
To summarise - a very good evening, enjoyed by all, excellent service. Highly recommended. Emni is for trendies...has to be, sitting, as it does, on the corner of Camden Passage. One would never stagger in here, well oiled, after an evening in the Nag's Head, it's more a chic venue for catching up on office gossip, sharing a bottle of sauvignon and so forth. Hi ho! Credit must be given for effort. The front of house team try hard to provide for their lugubrious guests. Poppadoms and chutneys are a little different, seemed as though they might just have been home made, especially a really smokey tamarind sauce. Starters were a departure from the normal curry house fare as anticipated. Spinach and lentil patties, stuffed with a fig were very dainty and pretty, tasted fine except for a little too much chilli, somewhat overpowering. Other dishes included Scallops with mint and coconut sauce, spicy chicken chops, tandoori brocolli with paneer etc. Portion sizes were perfect, left us feeling full but not fit to burst. Laal Mass, tender pieces of lamb in a chilli hot Madras style sauce with julienne of root ginger was rich and sharp and complemented by a cooling, creamy blueberry raita. Sides of charcoal grilled, flattened aubergine slices were tangy and alternative while the pilau was moist and plentiful with peas. The restaurant claims they provide a taste of 'Indian rediscovered' and although they are more than a three sauce suits all subcontinental, most of the menu is familiar to a seasoned curryholic except for a few twists here and there. In a sense this is their USP as most of us seek comfort in curry rather than too much adventure. The table is booked! On Wednesday 13th May, we'll be going back to Chilli Night in Haslemere, one of our favourite restaurants. Aperitifs will be at the Inn on the Hill from about 19:30, and then dinner will be at 20:30. We've postponed this visit from April, for reasons that we'll explain elsewhere. You can see our previous reviews on this restaurant by clicking here. I can hardly wait! As usual all current members will receive an e-mail and this will also be posted on our Facebook group. My sisters 21st birthday meal was a surprise. Not that I didn't expect her to make the grand old age, I just didn't expect to be invited, or for it to occur on a Monday when she and her friends were supposed to be on a last minute holiday to Portugal. In the modern age, as they discovered, passports are required for international travel, unless of course you have recourse to an uber efficient military. I started with Chassa (a low fat indian diary drink with coriander, certainly an acquired taste) as well as a large and highly satisfying serving of Aloo tikki - fried potato nuggets drenched in a delicious, warm, sweet, tamarind sauce with chickpeas, earthy cumin seeds and cooling yoghurt. I continued with lamb kholapuri, a chilli hot, rich, sour aniseedy curry with tender morsels of meat, sampled a chicken madras, plenty of heat, redolent of roasted coconut and the pervasive savoury flavour of curry leaf and enjoyed the rice, moist and plentiful, with a basket of neatly folded chapatis. In summary, Masala Zone is very good. It's not worth listening to the dissenters, of which there are some, because they come across as spoiled/niggardly, so in one word: recommended! To be frank - not mad like Bruno or shifty like Warren, but straight like... - Green Spice is a significant improvement on the previous encumbent of 61 Albert Road, Romance Of India. The venue is unprepossessing to say the least, squeezed in between defunct buildings on a corner where nobody lingers. The dining room, though modern, looks bland and devoid of atmosphere from the street. There's no jungle in the window anymore, so you can actually see in. Our party of four stepped across the threshold nevertheless and were greeted by a waiter who looked a little dishevelled (the first step in life is a well tied tie!) and somewhat slightly dazed. However, he and his colleague, smiled quietly and provided the most efficient and unassuming service I've had in a while. The starter section of the menu lists dishes that you simply won't find in these parts. Scallops in coconut cream, Venison Bhorta, Squid marinated in oven roasted spice and greek yoghurt. I chose Smoked (re: Somked) Paprika Salmon and it was executed with all the flair of a posh London Indian. A sizeable fillet of oily fish encrusted with the simple, direct and bold flavours of fresh paprika and dry, hot chilli powder alongside a long ribbon of juicy courgette. Rather excellent! Other starters included 'spicy' and seemingly crisp Onion bhajis in roundel form and Chicken Tikka, not an enormous portion but neatly presented once again. My Jalfrezi had plenty of fire as well, just the right amount. Decent chunks of chicken in a resinous, rich, cocktail sauce. In combination with Bhindi, diced and caramelized and pilau rice, moist, buttery and aromatic, it was very good. The food certainly didn't rush out of the kitchen and it seemed a lot of care had been taken on our behalf. Moreover, the total bill was £61 including drinks, great value! We were there for most of the evening and only two other tables were serviced. If you've discovered this blog and live in the area, do pay them a visit, I think you will be pleasantly surprised. Good things come to those who wait and I don't have Guinness or Heinz Tomato Ketchup in mind. We arrived at 8 and left around 11. The restaurant was full. Families, Rugby fans (no Welsh though), Yanks (Yuri) and a group who appeared to be sitting at a dining table, using cutlery for the first time - thankfully they were all but finished when we began. A bottle of Shiraz was consumed before starters were brought. I had Sinka Kurkura - extremely tender, melt in mouth chicken slices, skewered and in a smoked sausagey crust. Then a passable Cabernet Sauvigon from Chile was emptied before the main course - Khasi Bhutuwa, supple morsels of lamb in a thick, rich paste with red and green pepper, Hariyo Mis Mas or mix vegetables and paneer, tangy yet light and utterly delightful. Sweet Naans (Guylio Roti's) and pilau completed the meal, oh and rather decent Nepali Rum on the house! Consistently fine food in a casual setting with Pink Floyd in the background (albeit the Wall, worms eating into your brain etc) make this almost my favourite place in the area. * I am sure they are very good and they are playing on March 27th! 34-10 and the Gurkha Durbar in fine form too! Back after a fantastic day out at Twickenham (England beat France 34-10), we finished the celebration with dinner at the Gurkha Durbar. They were on top form, accurate, good service, delicious food. Choila, chicken livers, kukhura saag (chicken and spinach), khursani kukhura (battered strips of chicken breast cooked wth onions, peppers and chillies), some Nepali Ice beer - a great way to finish a great day. On a mild March evening, we went to Whitehill expecting to enjoy ourselves, and we weren't disappointed. The rendezvous was at The Woodlark, a Marstons pub which opened less than two years ago. It has a Two for One meal offer, and on Wednesday night, it was full of diners. It's cheerful, obviously doing what people want, and not hurt by the fact that the next nearest pub, the Outback, is boarded up. Its only pub competition in the Bordon/Whitehill built-up area is the Woodlands Inn, a full 1.5 miles north. The Dhanmondi staff were as welcoming as ever. However, the resturant wasn't as full as last time - whether due to the credit crunch, or the competition from the Woodlark, who knows? The restaurant suggested a menu that comprised a mixed starter and then six main dishes - lamb tava (Kashmiri spices) and shahslik, and chicken jalfrezi, balti, shashlik, and gusht e'ada (ginger, onions, peppers, medium hot). A selection of rices, naans and vegtables accompanied the main meal. Everything tasted good, and we left very little. We also enjoyed both the red and white house wines and the digestifs afterwards - thanks! In our feedback to the head waiter, we mentioned that all the main dishes seemed to be the same colour - a strong hint that they're using food colouring. To sum up, we had another very convivial meeting and Dhanmondi certainly stays on our list of places to visit. Our plans for the next two months are that in April, we'll be visiting Haslemere again (Chilli Night), and in May, Liphook (Gurkha Chautari). At risk of coming across as a look-back bore, India Gate was almost the first restaurant I wrote about. Almost the first, because I penned a sophomore review about Shapla before. Following a rather average meal in Alresford for the first anniversary of my 25th birthday on Tuesday (Deep fried seabass tail, needing a squeeze of lime to impart any real taste and a mediocre Halibut dish, with tasteless raw chillies and coconut cream, which took the edge of the overall flavour), it was back to Chichester's 'premier' curry joint. The dining room is modern, quite chic and was full. Run of the mill poppadoms with chutney tray kicked things off. There followed good, meaty Chicken Tikka with a piquant crust and Gosht Kata Masala - a hearty, worcester sauce infused, root gingery curry. Audente pilau and Niramish, robust, olive oil flavoured mix of cauli, carrots, spinach, diced potatoes and chick peas as well as a plum tomato, onion rich Korai and a great garlic Naan rounded off the meal. The food tasted pretty good and was presented in clean and colourful fashion, though if I wasn't working at the megalithic offices of Wiley-Blackwell I don't think I'd pay the train fare there and back. Sounds Australian, yes? Aborginal? Kangaroo on the menu?! Bush-tucker Grub? No! Thank heavens! It simply means ‘face to face’ in sub-continental speak. The place has been showered with awards over the last couple of years, including ‘best cheap eat in London’, and was rated highly in Harden’s restaurant guide. I had been intending to eat here for a while but plans can fall through as so often they do. Thankfully, as luck would have it, a hastily organised get together of publishing post-grads gave myself and 3 others the opportunity to visit this lively restaurant. The wine was really good. Never considered pinot noir as a good accompaniment to spicy food, but it’s mellow, plumy tones really struck the right note. We shared a few bottles, feeling frivolous, in part because prices are indeed truly reasonable, especially considering the eclectic meal we enjoyed. Starters (or ‘Lite Bites’) included ‘excellent’ steamed cod wrapped in banana leaf, lamb paratha’s and the wonderfully titled ‘Chicken Ooty Tooty’ - a trio of tikkas in a sandy coriander, fruity lime paste. All Tandoori items can be ordered as starter portions. Mains were various. Yuri’s fish stew was lovely and tasted like a good bouillabaisse with chick peas and tangy Indian spicing. Val’s lamb steaks came drenched in a beautiful ochre yoghurt sauce with dashes of cream and a subtle twist of rum, while Jeremy worked through his herby, coconut Malabar seafood bisque much to his Francophilian satisfaction. I enjoyed Naga Murgh, from the perilously hot Nagaland! Succulent, eggy strips of chicken cooked in a light but hot, citrussy sauce (derived from pickling spices including fenugreek, cumin and fennel) with the fabulous, crunchy texture of ‘Mooli’ (white radish). Pilau was good value at £1.95 and Naans were pretty fine although a side of crisp red veggies felt nothing more than virtuous and I have enjoyed better Saag Aloo. Nevertheless, we had great fun. 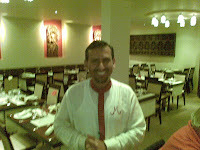 Rooburoo is run by an enthusiastic and professional team which consequently stands them apart most curry houses. Will return - for sure. Shahanaz - shame! The food was great but the impression was that they really don't want to play. We like to set the restaurant the challenge - for the given food price, impress us. Most restaurants do this really well. Shahanaz prefers not to take the initiative in this way; instead, we had to pick the food from the (extensive) menu.They didn't play ball at all; if a dish had rice included (there seemed far more rice than we'd ordered), they just kept quiet. The drink prices were excessive. House white undrinkable - in JA's view. Coffee and brandy after dinner - very expensive. It all left a slightly sour taste and no-one said we'd hurry back. For the record, we had a mixed starter each (expensive), and for mains we chose jeera beef (excellent), prawn dhansak (OK), tandoori chicken (good), chicken jalfrezi (very tasty), lamb nehari (delicious, lamb shank), and lamb madras. Rice, naans and three vegetables amongst six of us. We didn't go there meaning to push the boat out, but the price for six was about £270 including a modest tip. Including a pint or two in the pub beforehand, the evening cost over £50 per head. This isn't really what we want to see in these straitened times. You could go somewhere rather nice for that money. Usually we manage 12 for not much more than £300. In our view, Shahanaz does some great cooking; enjoy it as a take-away.